The First 100 Years - the complete book. 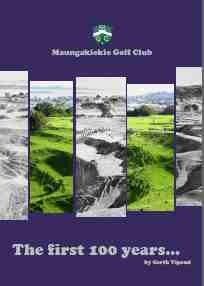 Click on the cover picture at left to download a PDF file of "The First 100 Years" by Garth Vipond - the definitive history of Maungakiekie Golf Club's first century. Be aware that this is a 7.5MB document - large downloads are more suitable for users with DSL/broadband internet access. Printed copies of this book are available from the club's Golf Shop. From Early Days on "The Hill"
For many years I lived fairly close to the One Tree Hill Domain and Cornwall Park, and as a boy, often visited the same. I have early recollections of golf being played on a course laid out on part of the Domain, including the two Amphitheatres. One of the holes was the famous "Jacob's Ladder" played from the Southern Amphitheatre to the plateau dividing the two amphitheatres. I never played on that course, but our club was formed in 1909 to take over from the Auckland Golf Club after that club shifted to Middlemore. By the time I joined our club in 1927, it had moved from the Hill course to the area owned by the Campbell Park Trustees, extending down to Campbell Road with one hole located on part of the Domain area near where the sheep yards are now situated. Members and others will no doubt be interested to read of the part played many years ago by our club in the purchase, planning, development and naming of the present Titirangi Golf Course and Club. Until the later actual severance of the two clubs, members were entitled to play on both courses on payment of a small extra subscription. Regarding the severance, that was finally carried out in 1931 by the name of the club being changed to the Titirangi Golf Club and by those members wishing to continue at One Tree Hill, forming the present Maungakiekie Golf Club to carry on the existing course. In 1942 the club received from the Campbell Park Trustees, notice terminating its tenancy of the course property. Many of our members were very perturbed at this but in spite of a petition signed by many members anq other citizens, and also very strong representations by the Club's Officers, the Trustees would not withdraw the notice. The club is very much indebted to those Officers for their efforts in trying to find an area of land for a new course, ending in their deciding to purchase our present site. Mt. Roskill, at that time, was still largely a rural area and many of us can remember that from where the clubhouse stands, there was then only one dwelling visible in a southerly direction. The Committee was faced with tremendous problems regarding finance for purchase and development costs and an arrangement was made with the Housing Corporation to purchase from the club, the Richardson Road frontage (reserving the necessary land for access to the remainder of the property). Considerable work was involved in getting a course planned by a golf architect, the formation and sowing of fairways, greens and tees, tree planting, provision of access road and parking area, and a clubhouse. These works would be difficult enough in normal times but we were in the middle of the Second World War and labour and materials very hard to get. The provision of a clubhouse presented a particular difficulty, but finally, with the help of one of the senior officers, a couple of army huts were purchased and renovated to make do. Many working bees were held to do a lot of the necessary work. The area, now served by Anita Avenue, was covered in gorse, and to take care of this nuisance, pine trees were planted by a working bee. As the new course could not be used for quite a time, and as many of our members and members of our close neighbour, Akarana, were serving overseas with the armed forces, a satisfactory arrangement as to subscriptions and numbers suggested by Akarana for sharing their facilities was gratefully accepted. Our sincere thanks are due to Akarana for their generous gesture at that time. The friendly relations then established still exist. A decision of the club to clear and subdivide the Anita Avenue area was taken in 1965. This naturally involved the felling and clearing of the pine trees which had kept down the gorse and had grown to a considerable height. Also, contracts had to be made for surveys and roading to the area; The sale of sections was considerably helped by purchases by a number of memhers and it is pleasing to be able to say that the present fine clubhouse was financed by the proceeds of sales of sections. Other surplus land has from time to time been subdivided and sold to provide funds for much needed facilities. 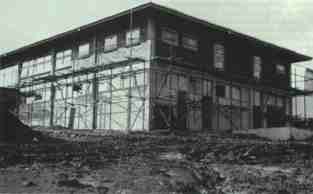 On 5 October 1909 a new golf club was formed following the departure of the Auckland Golf Club from its course on the slopes of One Tree Hill, Auckland to its new course at Middlemore. The new club was named Maungakiekie and for its first two years it operated on a 10 hole course located on the One Tree Hill Domain. In 1911 it was able to lease additional land from the Cornwall Park Trustees to enable a full 18 hole course to be formed. Early in 1914 the Club was suffering from overcrowding and decided to look for land on which to build an additional course. A sub-committee identified a suitable area of land at New Lynn, which was subsequently purchased. Arrangements were made with the owners (the Gardner brothers) to lay out a course and early in 1915 it was decided to name that course Titirangi. The 1914-18 War then intervened and many of the Club’s members were called to military service. A beautiful carved oak Roll of Honour to commemorate their service was presented to the Club by Mr G Lawrence Taylor on Opening Day in 1919. This is now located in the Maungakiekie clubrooms at Mt Roskill. After the War, the Club experienced rapid growth in membership and during the 1920s it had the largest membership in NZ. In 1920 Edward Prince of Wales was engaged on a Royal Tour of NZ. A rail strike forced the Royal Train to return to Auckland and as there were no fixed appointments the Prince played a round of golf with his cousin, Lord Louis Mountbatten at the Club’s One Tree Hill course. The Prince enjoyed the game so much that he returned for another round the following day. He was particularly impressed by a hole named “Ampitheatre” where the tee shot was from the elevated rim of a crater to a green located on the floor of the crater. That hole and the previous hole named “Jacobs Ladder” were widely known by golfers throughout the Commonwealth. Later in 1920 the Titirangi course was opened for play, and for the next 10 years Maungakiekie was operating two courses and two clubhouses separated by over 10km. From 1921 onwards members could choose to pay at either Maungakiekie or Titirangi or at both courses. The 1921 subscription for either course was 3 guineas for ladies and 5 guineas for gentlemen and for both courses was 4 guineas for ladies and 7 guineas for gentlemen. In 1925 the Club relinquished its lease of the One Tree Hill Domain land and leased additional land from the Cornwall Park Trustees. 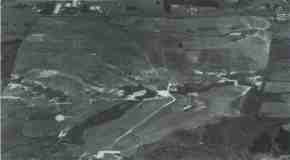 From that point until 1942 all 18 holes at Maungakiekie were located on the Trust land which fronted Campbell Road. The McKenzie layout for Titirangi was duly approved and was implemented over the next few years. It has stood the test of time and Titirangi is regarded as one of the finest courses in New Zealand. By October 1930 there was a feeling among the Cornwall Park members that a disproportionate amount of the Club’s expenditure was being spent on developing the new Titirangi course to the detriment of improvements to the Cornwall Park course. They called a special meeting of the Club which was attended by 300 members who resolved that the Cornwall Park assets be vested in a new club be formed to continue playing at Cornwall Park and that the existing Maungakiekie Club be renamed as the Titirangi Golf Club. 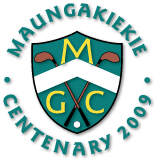 The club which remained at Cornwall Park took over the name of the Maungakiekie Golf Club and arrangements were put in place for members to be able to choose which Club they would be members of. Both Clubs proved to be very popular and within just a few years each had experienced major membership gains. The “new” Maungakiekie Club held a strong belief that its leasehold tenure of the Cornwall Park course was theirs on a permanent basis. Sadly the Cornwall Park Trustees had other ideas and in September 1942 served notice on the Club to vacate Cornwall Park within 3 months. This action created enormous interest among the general public and a petition containing over 9000 names requesting the Club be allowed to remain was presented to the Trustees. The Trustees stood firm and the Club was forced to vacate Cornwall Park in early in1943. It quickly started a search for suitable land on which to re-establish and by September 1943 had purchased land at Mount Roskill. In the meantime the members were able to continue playing golf due to the generosity of the Akarana Golf Club, who made their course available to the Maungakiekie members. In 1943 the Club contacted Sloan Morpeth, a former secretary of the Club, who was at that time secretary of the Commonwealth Golf Club of Australia, seeking his advice as to a suitable golf architect to design the new Maungakiekie course. Morpeth recommended Charles Alison of Colt, Alison and Morrison, an eminent golf architect who had designed the Huntingdale course in Melbourne without leaving his base in England. Alison accepted the Maungakiekie commission and designed the new course using contour plans, wind, rainfall and humidity tables, again without leaving England. The new course was quickly established with the greens being formed by hand at many working bees, and play commenced on it in 1946. It is significant that Charles Alison and Alister McKenzie were both protégés of the legendary Harry Colt and that both the original Maungakiekie and the “new” Maungakiekie clubs were able to obtain their services. Both men were regarded as among the worlds best golf course architects of their time, and the present Maungakiekie and Titirangi courses are the only examples of Alison and McKenzie courses in New Zealand. Clearly the intention was to represent a single tree growing on a hill, with the word Maunga used to indicate the hill as we understand it. Specific interpretations might vary a little because I doubt if the tree described was in fact the KieKie, so we see the name in rather a broad sense to indicate a tree. The KieKie itself is a very unique shrub and was a very useful item to the very early life in New Zealand. 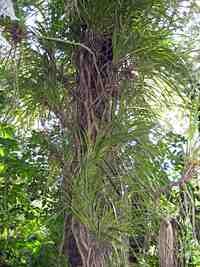 A member of the climbing species (Pandanacea) with a stem of up to 4 centimetres in diameter, its aerial root system secures it to tree trunks as it spirals its way to almost any height. On the way up it forms many crowns similar to cabbage tree heads made up of metre long leaves finely serrated on the edges and under rib. The Bract (Tawhara) or new leaf growth and the 3 to 4 inch spike-like flowers are edible with the male and female flowers growing on separate plants, (Dioecious) and appear in the Spring but the fruit (Ureure) ripens the following year about May. This fruit is similar in shape and size to a corn cob with fleshy succulent seeds in a rather bony casing (Drupaceous) and the casual hiker would be extremely fortunate to find a ripe KieKie ahead of the rats, possums or almost anything else that lives in the forest. In the early 1940’s during the unsettling days if WWII, members of the Maungakiekie Golf Club made the decision to create a fund to erect a memorial on club property in honour of those younger members who had answered the call to duty in the armed forces. Military necessities were not favouring the club at this time, with the tenure on their lease-hold property at One Tree Hill terminating due to the need to establish a military hospital to care for the American casualties which were expected from the conflict taking place farther north. So in 1942 Maungakiekie became a club without a course. Nevertheless, a much-depleted membership managed to raise the then not insignfcant sum of £500 with the intention of proceeding in the near future with the project for which it had been raised. At the same, members promised themselves that when hostilities ceased and the servicemen returned, there would still be a club to welcome them back. Accordingly, under difficult war-time conditions, the land which had been purchased was developed with members bringing grubbers, scythes and slashers working in the the weekends bringing this about — a dramatic change from their normal habit of bringing golfclubs to the area! It is recorded in the Club's minutes that with the organizing of working-bees, 14 greens were laid in a single day, and so it was that in 1946 the new course opened for play. However the years passed by without action having been taken on establishing the memorial; something apparently overlooked by the various managements of the Club. But this state of affairs was not to last, for a zealous historian perusing past minutes established the facts and brought them to the attention of the then current committee, at which point the commitment made so many years ago, was once again on the agenda. Alter the design selection process had been gone through, the favoured entry, a curved rock wall, and attached memorial plaque was established adjacent to the first tee in 1995. The dedication service was conducted by Reverend Cecil Wright, himself a war-time POW. For the initial annual ceremony, it was thought fitting that POWs would be responsible for the proceedings — and this ceremony we well-attended. Each year a different arm of the services takes charge of the proceedings. For the following four years the Anzac service was conducted by the Reverend Audrey Ancrum and, after her transfer in 2000, the Club has had the services of the Reverend Murray Hall who brought with him his “Men of Music” from the Mount Roskill Probus Club. A definite enhancement to the quality of the singing which takes place on these occasions! So it is that every year, to the sound of the Last Post echoing around tbe green hills and valley which make up the Maungakiekie Golf Course, those on the course, as do others all over New Zealand, stop to show their respect on this significant day of remembrance.